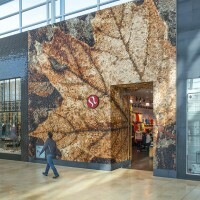 Brothers Dressler together with the Lulelemon Design Team and Quadrangle Architects have designed and created the facade and various elements of the Lululemon Yorkdale retail store in Toronto, Canada. 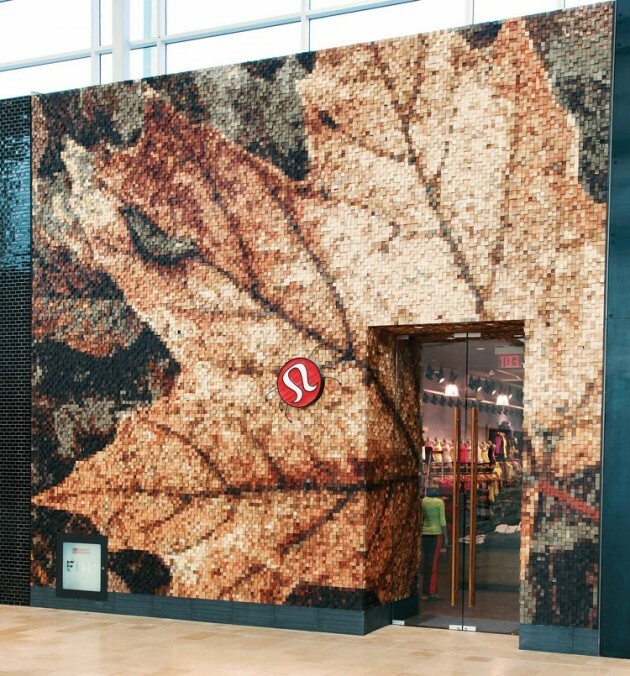 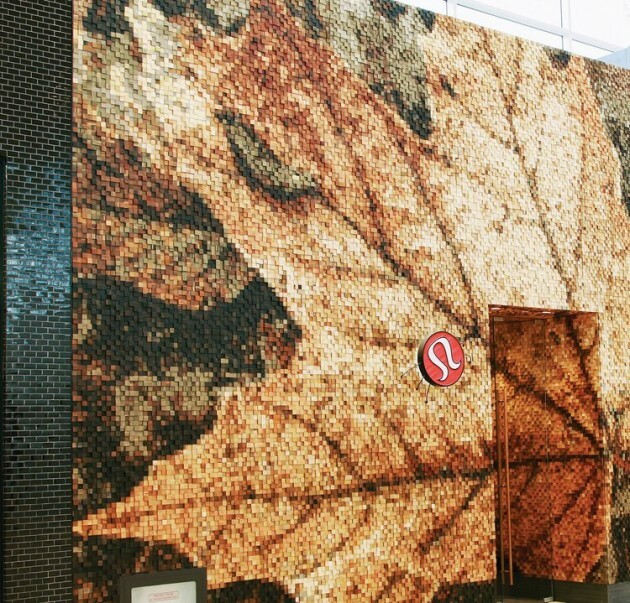 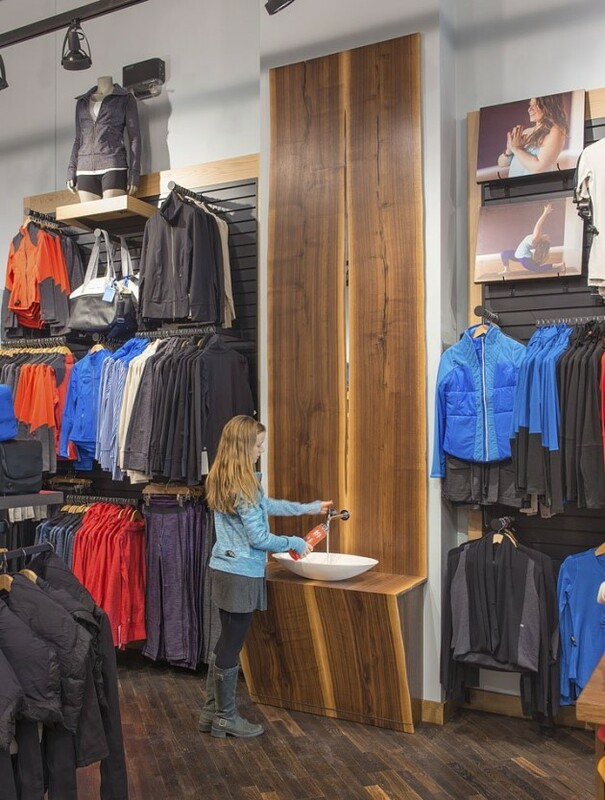 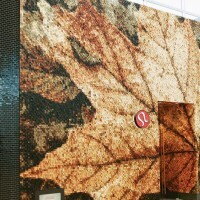 We collaborated with the Lululemon Design team and Quadrangle Architects to add some unique elements to their new store at Yorkdale Mall in Toronto. 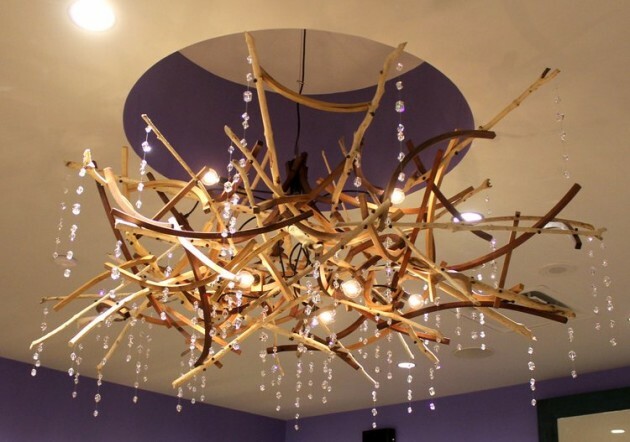 From our initial concept we designed and built the storefront facade along with a unique art installation, a chandelier made with beaver chewed sticks and a water feature within the store. 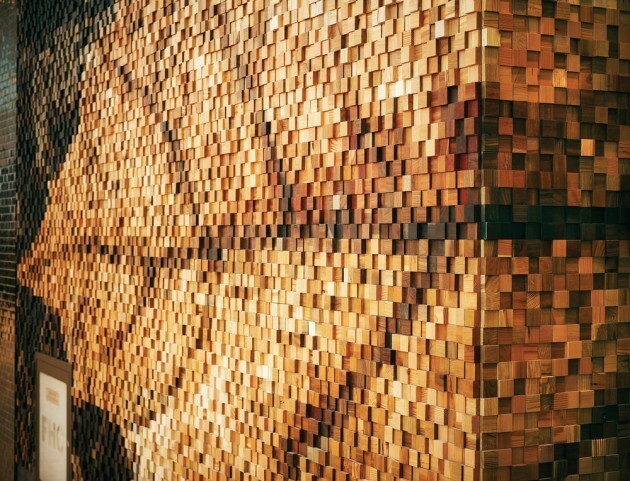 THE STOREFRONT – The front facade and entrance is a mosaic crafted from 35,788 wooden blocks made from a variety of woods salvaged from the collected history of the Brothers Dressler workshop. 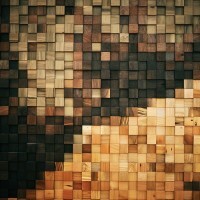 Inspired by our photograph of a fallen leaf, the palette is comprised of all the natural colours of these woods pixelated into the image. 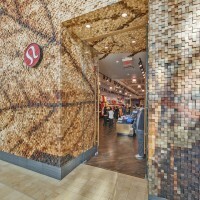 This mosaic embodies the history of these woods from tree to beam to stave to lumber and everything in between. 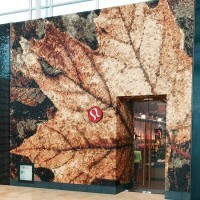 An historic mixture that spans years and even centuries. 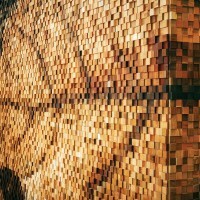 The trimmed ends of solid wood tables, staves of a 16 foot diameter barrel, portions of an old Toronto school, shipping pallets, submerged beams and off cuts from countless other furniture pieces come together in their true colours to begin another chapter of their story. 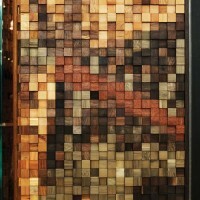 The woods were collected from the stock at the Brothers Dressler Workshop. 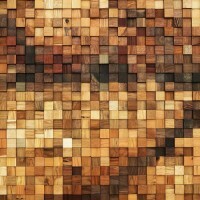 They include off-cuts from pieces, leftovers from jobs and extra pieces collected over the years and are shown all in their natural colours. 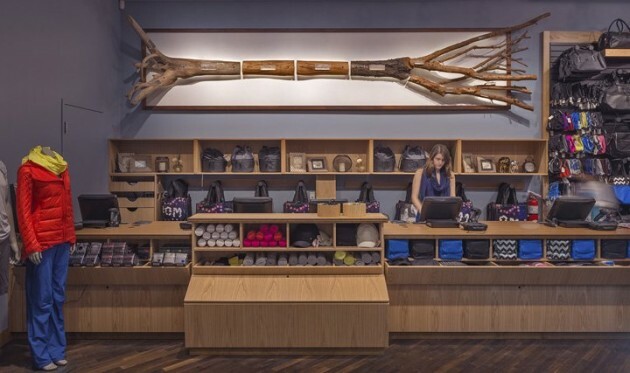 CASH ART – Behind the cash desk hangs our exploration of the relationship between natural growth, our bodies and the calm nature of trees. 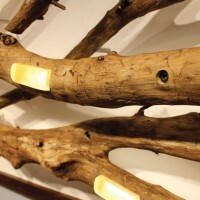 Re-created out of misplaced limbs and sections of found trees, an uprooted tree is divided into the 7 chakras of the body and breathes calmly with embedded LEDs glowing through cast glass sections of bark. 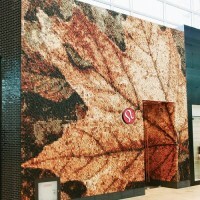 The idea of this piece was to evoke a peaceful experience as one looks up to the re-assembled tree. 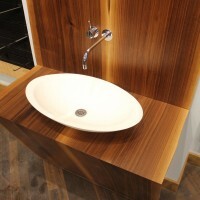 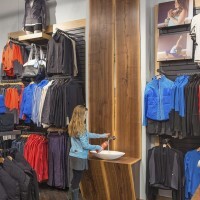 WATER STATION – To replenish those precious fluids we created a water station out of veneer mill ends of a walnut tree with Arne Jacobson’s timeless faucet design pouring from a crevice into a white corian sink. 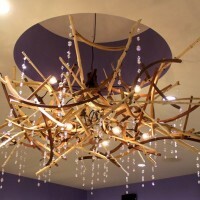 CHANDELIER – At the far end of the store hangs a new light fixture resplendent with SWAROVSKI ELEMENTS crystals and melding the steam bent workmanship of our workshop with the incredible tenacity of the beaver who cleaned up the found sticks to eat the bark but could not build his dam as we intercepted them floating in Lake Manitouwabing.